Page 1 of the journal. Inside back cover of the journal. Clergyman, author, and publishing agent John Emory (1789–1835) served as Editor of The Methodist Magazine from 1828 to 1830. A strong advocate for education, Emory contributed to the founding of Wesleyan University and New York University. Emory College (now Emory University in Atlanta, Georgia) was named in his honor. 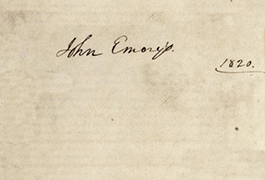 The 1832 Methodist Episcopal Church General Conference elected Emory to the office of bishop. 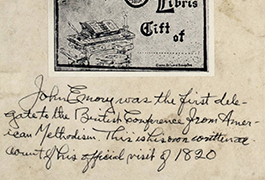 In 1820 Emory became the first American to serve as a delegate at the Methodist General Conference in England. 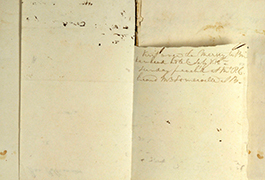 Presented here is Emory’s manuscript journal of 1820. 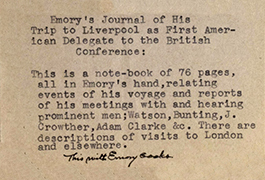 This volume records his travels to Liverpool and London and his meetings with incoming Conference President Jabez Bunting (1779–1858), past President Jonathan Crowther (1759–1824), and the great Methodist scholar, Adam Clarke (1760 or 1762–1832). 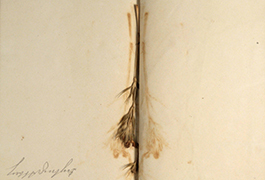 This journal appears not to have received first-hand study since 1841, when Emory’s eldest son, Robert Emory (1814–1848), published selected excerpts in The Life of the Rev. John Emory. 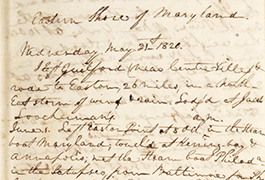 Additional information about John Emory's 1820 Journal at Bridwell Library is available in the Early Methodists and Their Books web exhibition on the Bridwell Library website. This digital collection of the journal of John Emory presents large-format scans of the entire journal. For more information, please contact Bridwell Library Special Collections.